With all the talk about smart watches and Apple watches we started talking to people at tech events, and even the Apple event and many were in agreement, not everyone wants a smart watch. When it’s time to unplug, button up and hit a formal event, a Pebble or even Apple Watch looks out of place. Gone are the days when you could use a smart watch to nonchalantly look at a text message, or notification while sitting in a meeting. You don’t want to be “that guy” or “that girl”. So in looking for a great time piece, and a watch that says style and sophistication, that’s also durable and built to last, we found The Rider’s Watch by hunterharmony. 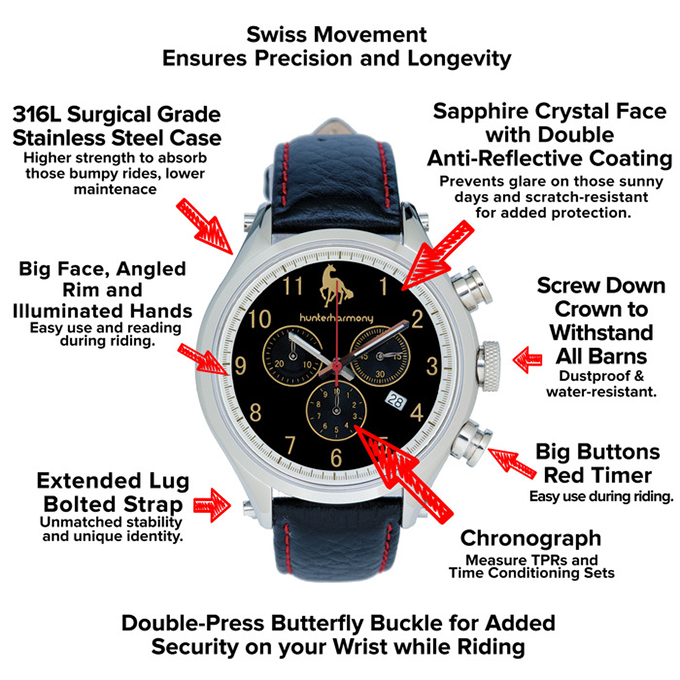 The Rider’s Watch was designed to withstand the active lifestyle of a horseback rider, trainer or stable hand. But when you peel back the label Rider’s Watch you start to see that this is a time piece that can be enjoyed by many. The design makes it perfect for a man or woman in even the most contemporary of settings. hunterharmony’s watch would be perfect for the country club, whether you’re taking in a meal with business associates and then a round of golf or even a tennis match, you can continue to wear The Rider’s Watch as you eat, play and enjoy the company of even your most esteemed colleagues and associates. Rider’s of course want to know what time it is or use the Chronograph to track their rides. 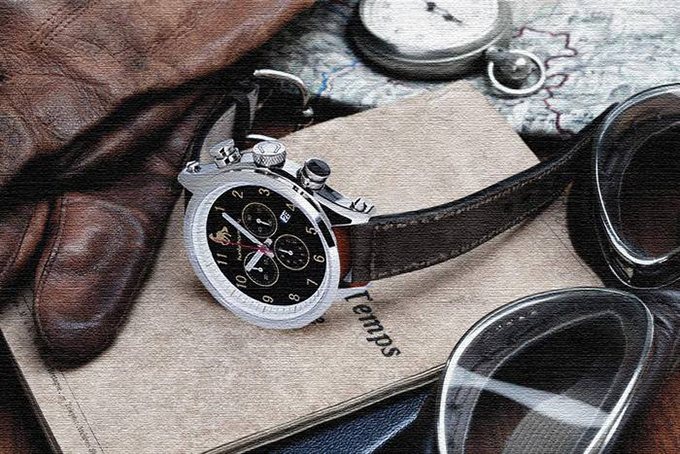 These tasks are easy with The Rider’s Watch’s large face and easy to understand dials. Appel realized how durable the watch was after scraping it’s saphire face on a barn wall and seeing “it was scratch free and still gleaming.”. The hunterharmony watch is already in production. The company has taken to Kickstarter to ramp up mass production and will have pre-order/backer orders out in November, with plenty of time to spare before Christmas. That means you could easily wear your hunterharmony Rider’s Watch to holiday dinners and family events. 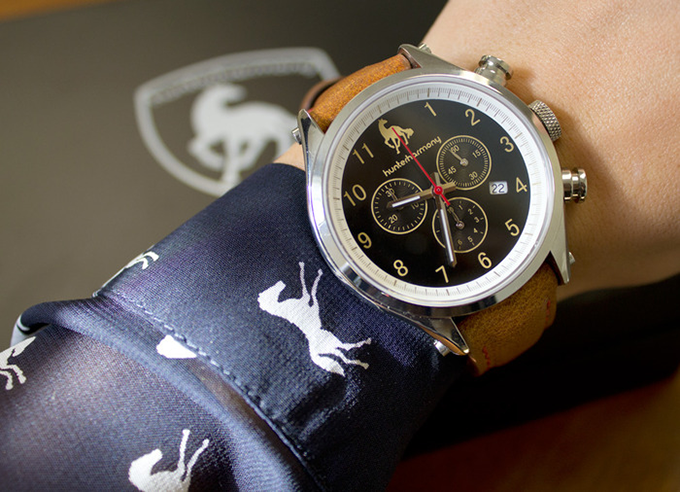 While horseback enthusiasts have been longing for their own watch, with as stylish as this watch is, it’s sure to be seen everywhere that anyone requires a sharp, durable watch that can be worn with riding clothes, khaki’s and a golf shirt, or buttoned up for a formal dinner. You can pre-order your Rider’s Watch here at Kickstarter.